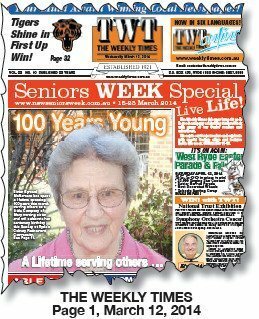 JB’s World: Our first paperboy – 105 not out! 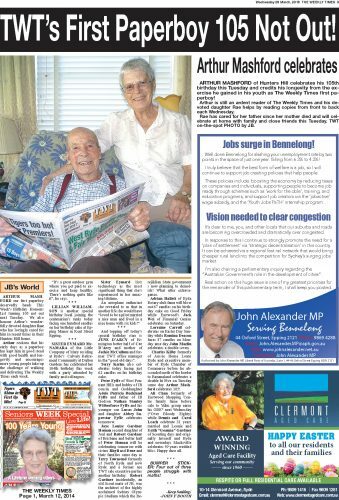 The Weekly Times’ first paperboy Arthur Mashford of Hunters Hill celebrates 105 – not out! – next Tuesday and credits his longevity from the exercise he gained in his youth as The Weekly Times first paperboy! Arthur is still an ardent reader of The Weekly Times and his devoted daughter Rae helps by reading copies from front to back each Wednesday. ARTHUR MASHFORD our first paperboy deservedly heads this Week’s Birthday Honours List turning 105 not out next Tuesday. We also honour Arthur’s wonderfully devoted daughter Rae who has lovingly cared for him in recent times in their Hunters Hill home. Arthur reckons that his early days as a paperboy has kept him in good stead with good health and longevity and encourages more young people take up the challenge of walking and delivering The Weekly Times each week. “It’s a great outdoor gym where you get paid to exercise and keep healthy. There’s nothing quite like it”, he says. LILLIAN WILLIAMSON is another special birthday local joining the centenarian’s ranks today facing one hundred candles on her birthday cake at Epping Manor in Kent Street Epping. SISTER EYMARD McNAMARA of the Little Company of Mary residing at Ryde’s Calvary Retirement Community at Dalton Gardens has celebrated her 104th birthday this week with a party attended by family and colleagues. Sister Eymard lists technology as the most significant thing that she’s experienced in her amazing lifetime. And topping off today’s special birthday stars is JUNE D’ARCY of Ermington better half of Cec D’Arcy and mother of Jackie McCallum and former TWT office manager in the “good old days”. Terry Kerim also celebrates today facing just 62 candles on his birthday cake. Peter Fyffe of West Pennant Hills and hubby of JB cousin and Goddaughter Adele Patricia Buckland Fyffe and father of JB Godson Nathan Stanley Wilberforce Fyffe and his younger son Lucas John and daughter Abbey Superstar Fyffe celebrates tomorrow. Jaye Louise Gardner Homan second daughter of Joal and Robert Gardner of Brisbane and better half of Peter Homan will be celebrating tomorrow with sisters Rhyll and Dene and their families same day as Terry Townsend formerly of North Ryde and now Ryde and a former ace TWT sale executive parties another birthday. Robert Gardner incidentally, an old Scout mate of JB, was the architect of the highly acclaimed Sydney Olympic Stadium which the Berejiklian State government s now planning to demolish! What utter extravagance. Adrian Hallett of Ryde Rotary club fame will blow out 67 candles on his birthday cake on Good Friday while Eastwood’s Jack Wei of Financial Genius celebrates on Saturday. Lorraine Carroll celebrates on Easter Day Sunday while Romina Deacon faces 37 candles on Monday ame day John Mazlin celebrates a double seven. Charles Kilby formerly of Aussie Home Loans Ryde and executive member of Ryde Chamber of Commerce before he absconded north of the border to Bananaland celebrates a double hi Five on Tuesday same day Arthur Mashford celebrates 105! Ali Chan formerly of Eastwood Shopping Centre family fame before sale to Yuhu group earns his OBE* next Wednesday (*Over Bloody Eighty) while Dennis and Carol Leach celebrate 31 years married and Leonie and Keith “Goanna” Gardner of Scouting days and originally Inverell and Ryde and nowadays Macksville celebrates 59 years wedded bliss. Happy daze all. BUMPER STICKER: Four out of three people struggle with maths! Former Hunters Hill Mayor: We’re not the threat, Gladys is!